My dad makes the best homemade shrimp macaroni salad. Everyone who eats it, absolutely loves it. He always get’s asked to make it for birthday parties, showers, picnics, and even Christmas. Dad has 4 grandkids and every one of them requests it for their birthday, every year without fail. I’ve learned to pay close attention to details when I watch my dad cook. He always has little tricks up his sleeve. 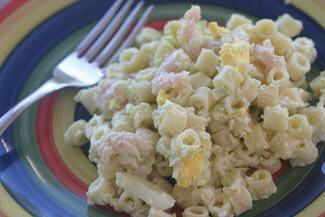 His classic macaroni salad contains, yellow onion, celery, hard boiled eggs, shrimp, mustard and mayo. Sounds simple right? His secret is that he chops up the onion and celery really fine. Some people might even say microscopic fine. And for reasons explained below, this makes a HUGE difference. Here is why I think it is such a big deal. Chopping the onion and celery really fine means that both are so well distributed through out the salad that the flavor is spread everywhere and it’s more subtle. Most people just rough chop these two ingredients and you get a few big pieces that over-power the flavor in certain bites. Imagine taking a bite of some simple macaroni salad and you end up with this rather large clump of onion and or celery, and that’s all you taste in that bite. Then you have bites that don’t have any onion or celery at all. Hence not as much flavor. You never find that with this seafood macaroni salad. So chop your onion and celery super fine and you will be amazed at how good this makes it. Really. Hard boil the egg by placing an egg in a pan of cold water. Heat the pan over high heat. When the water starts to boil, cover and turn off the heat. Let the eggs cook for 17 minutes. 18 if using extra large eggs. When the egg is done, pour out the hot water and fill the pan with cold water. When the water turns warm, replace it with more cold water. Add ice to chill quickly. First boil the noodles according to package directions. While noodles are boiling, finely chop the onion and celery. If you have the immersion blender like I show in the video, you will have this part done in a flash. Otherwise, start off thinly slicing the onion and celery and then chopping in the other direction. This will get it done quickly. And remember, chop until it’s super fine. Place the onion and celery in a large bowl. If the noodles are done, drain them in a colander and rinse under cold water. Use your hand to mix the cold water through the noodles. Don’t stop mixing until all the noodles are cold. This is important before we add the mayonnaise and shrimp. We don’t want to encourage bacterial growth by combining hot and cold foods. Add the noodles to the bowl and mix well. Add the mayonnaise, mustard, shrimp and some salt and pepper. Mix well. Peel and chop the egg into fairly large pieces and stir in. Taste and adjust salt, mayonnaise and mustard to your liking. Cover and store in the refrigerator until you serve it. This shrimp macaroni salad can easily be doubled, tripled or even quadrupled as needed. My dad makes this recipe when we have Mexican food. It goes great with just about anything. Try it an let me know how you like it.